Abigail MacKay is a rarity, a detective for the famous Pinkerton Detective Agency at the end of the nineteenth century. In Innocent Bystander (The Innocent Mystery Series Book 3), by C.A. Asbrey, Abigail is drawn west from her home in New York in search of her missing sister, Madeleine, who it appears has run off with a man suspected of leaving a trail of dead, rich wives behind him. The problem is nobody appears to know how he is killing his wives and, although suspected of murder, no charges have ever been brought against him. When Nat Quinn, notorious bandit and leader of the Innocent gang, and his erstwhile Uncle Jake rob a train in Wyoming, they discover among the passengers the beautiful and seductive Madeleine, who instantly reminds him of Abigail, with whom he has had previous romantic and unresolved issues. When Abigail realizes Nat and Jake are her best chance to find Madeleine and save her from her killer husband, she heads into outlaw territory and persuades the pair to accompany her to San Francisco where they will try to discover the mysterious method by which the killer disposes of his wives without medical professionals being any the wiser. 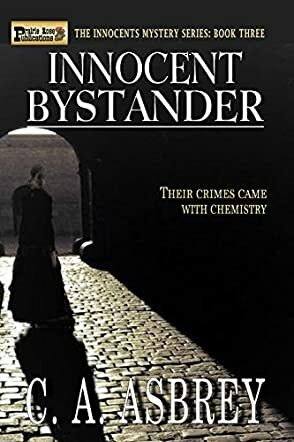 Innocent Bystanders is a powerful and exciting adventure that captivated me as a reader from the first page. I had not read the previous two stories in this adventure, but author C.A. Asbrey did a superb job of filling in the gaps of what occurred in books 1 and 2. The characters of Abigail, Nat and Jake could almost have been taken from a “western adventure annual.” They are overdrawn, but purposely, I’m sure, by the author to emphasize their characters. Nat and Jake were far from your average outlaws, with both having a strong moral compass buried beneath their outward bluster and toughness. Similarly, Abigail was your archetypal heroine; strong, independent, free thinking and willful, everything you’d expect from a Pinkerton female detective. The author marvelously managed to imbue her with a softer, feminine and uncertain side to her character that just rounded her out perfectly. The plot is cleverly constructed and keeps the reader fascinated. Although this story could probably be classified as a “western," it is far more than that and will appeal to aficionados of western, romance, murder/mystery and adventure tales. All in all, this is an excellent read and highly recommended.